Pamper, massage and relax your feet in the comfort of your own home. 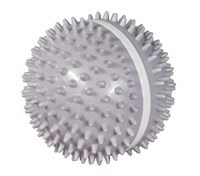 Simply Relaxing Vibrating Foot Massager improves flexibility and increases relief from stress and tired feet. Easy to use-- just press gently on the pedal to massage your feet. Let the soothing vibrations of this foot massager relax you and give you the relief you need after a long day! Requires 2 AA batteries (not included). Contains vibrating foot massager, user manual and 1-year warranty card. Measures: 6 1/2 L x 4 1/4 W x 2 H inches.